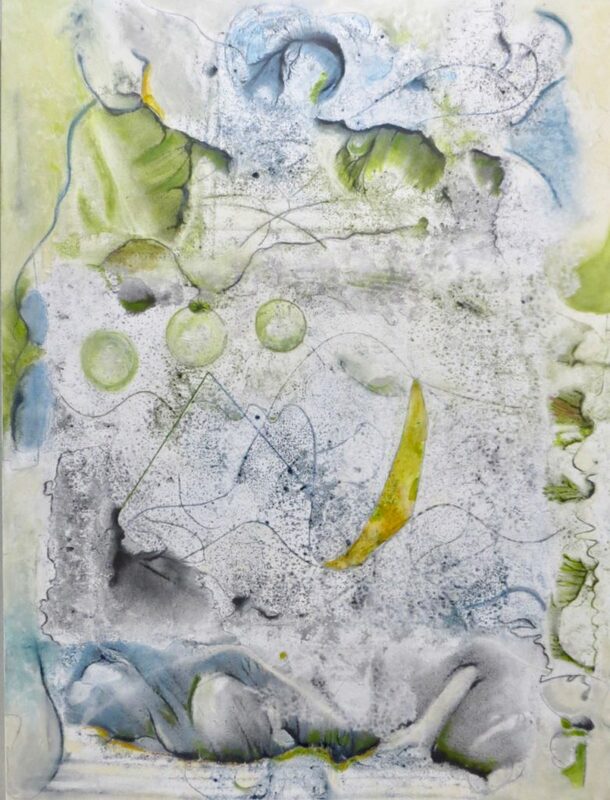 The title, “Prescience of Three Minds” that we selected for two collaborative paintings really describes the experience that Grace Howl, Amy Ernst and I had while working together to initially create a 48” x 36” painting which then morphed into making three artworks as well as supporting a charity. “Prescience: the fact of knowing something before it takes place; foreknowledge: the uncanny prescience of children: farsightedness, foresight, foreknowledge; psychic powers, clairvoyance; prediction, prognostication, divination, prophecy, augury; insight, intuition, perception, percipience.” New Oxford American Dictionary. It all started a year ago when we were hanging out and the conversation turned to the question, would it not be fun to do an exhibition together? 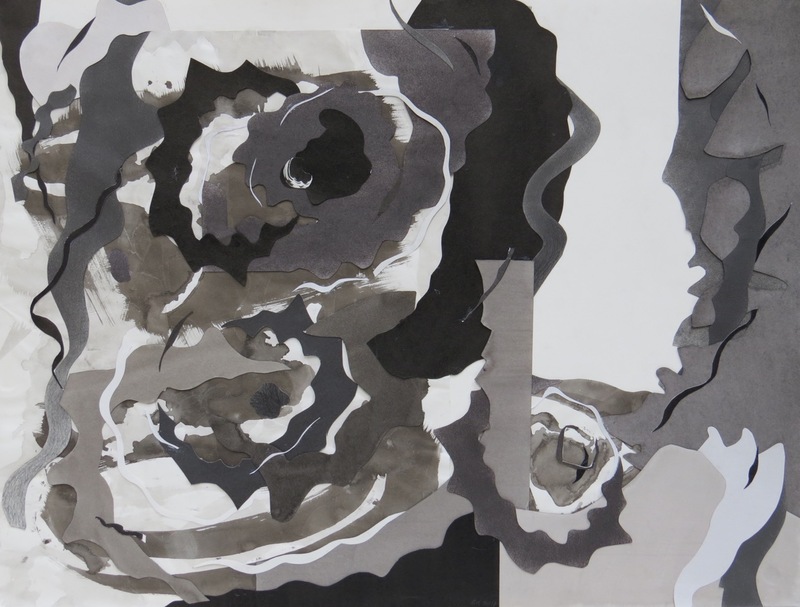 Being that we work in different disciplines, Grace – painting, Amy – printmaking and me – drawing, and all of us have collage in common, we thought it would be a good mix. 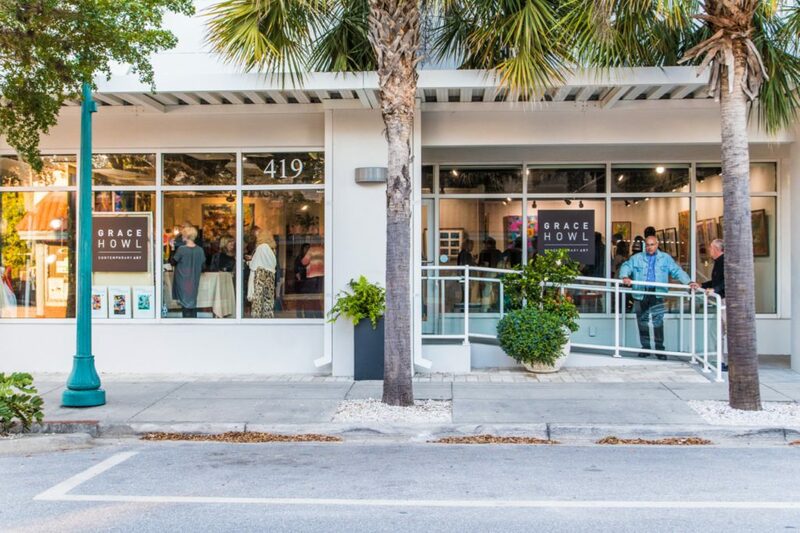 At the time we were discussing the collaboration, Grace who calls Sarasota home all year was in the process of securing a new studio space with adjacent display/gallery space. She moved in over the summer and officially opened in October. Amy splits her time between Sarasota and New York as I do with Chicago. After a few months absence, both Amy and I returned to Sarasota in early December. Shortly there after, the three of us began planning and selecting potential dates for the exhibition our respective works. We needed a theme and began discussing those options. By mid-January plans were falling into place. 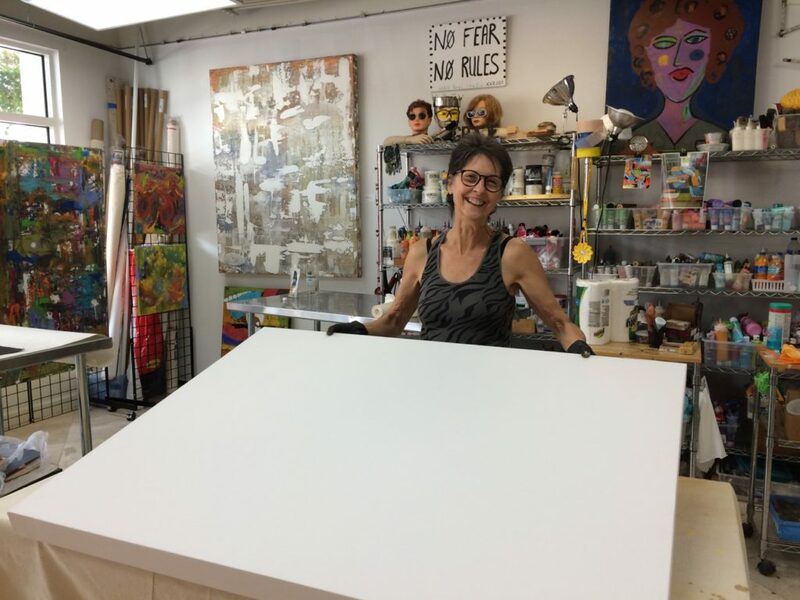 Grace’s new studio is in the Rosemary District which is a changing neighborhood so she expressed a desire to give back to the community somehow by our joint exhibition. All three of us have had experience creating artwork with another artist, so why not the three of us create together? This gave us the platform to raise funds by creating a piece of art which would be auctioned to benefit to the charity. We discussed a number of charity possibilities until Grace found a non-for-profit about which she was excited. It happened by chance when she saw an advertisement for Pines of Sarasota. Learning about what they do and knowing that they are located a few blocks from the studio, we all enthusiastically agreed to asked them if they would be interested in partnering with us. Grace contacted them and they were immediately thrilled by our idea. 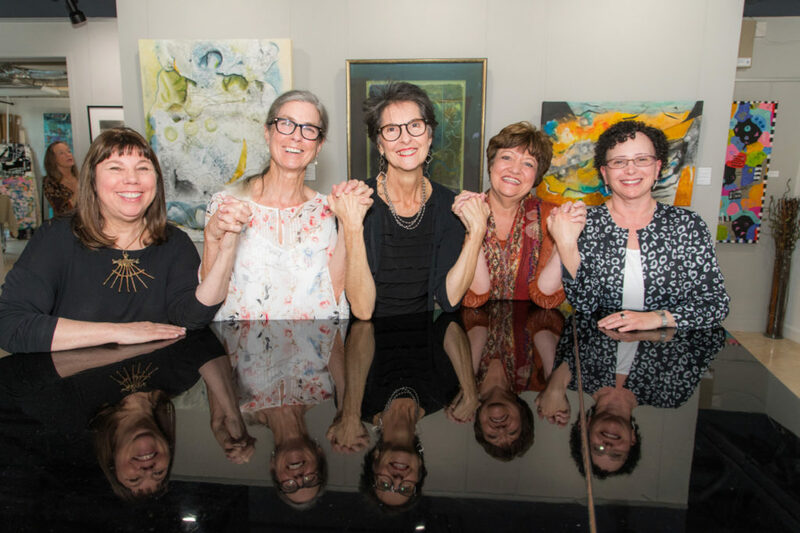 From left to right: Amy Ernst, Kate Hendrickson, Grace Howl with Janet Ginn and Terri Arnell of Pines of Sarasota Foundation. Pines of Sarasota is a nonprofit senior care community center providing rehabilitation services, skilled nursing, memory care, and assisted living, as well as educational programs for seniors and their families designed to help enhance their quality of life. Residents count on Pines of Sarasota for everything they need to live with dignity and freedom from worry about their finances. Pines of Sarasota recently embarked on a multimillion-dollar project to bring much-needed renovations to the aging campus. For every dollar raised it would be matched by two. A silent auction for the collaborative artwork would begin opening night and conclude with the winner being announced at the closing party. However, we still had not chosen theme or title for the show. That would come surprisingly later. Our goal now was to create the artwork that was to be auctioned. 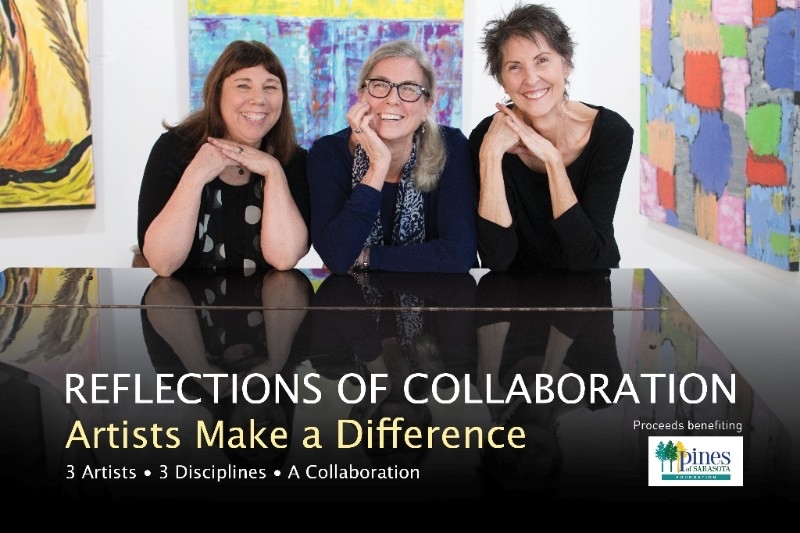 From left to right: The promotional photograph for the exhibition with Amy Ernst, Kate Hendrickson and Grace Howl. Both Amy and I had travel plans for a quick return to our respective northern cities in January so we had to get the start date for the collaborative work on the calendar. So in early February, we began our collaborative adventure. We scheduled sessions on days where we three could spend the time without interruption and stay as long as needed. And indeed, those days were very long with lunch and dinner breaks. Over the course of six weeks, we had 8 sessions together. Grace Howl with the blank 48″ x 36″ canvas. Initially we only planned to create a single 48” x 36” canvas. However, Grace pointed out that maybe we should practice on a smaller canvas that is 24” x 36” and see how that goes before we launch into the larger one. This ended up being a bright idea. So you have three artists and a blank canvas. What next? Lower the table upon which we would be placing the canvas so Amy could reach across it. To date I do not remember who made the first mark, but that mark began a very organic way of working. We three applied materials rotating around the canvas while in conversion the entire time about what was working and what was not. Without a preconceived idea, we allowed the universe to flow. We experimented by diffusing acrylic paint washes with alcohol. We introduced collage that included paper that was already colored or had images as well as rice paper. 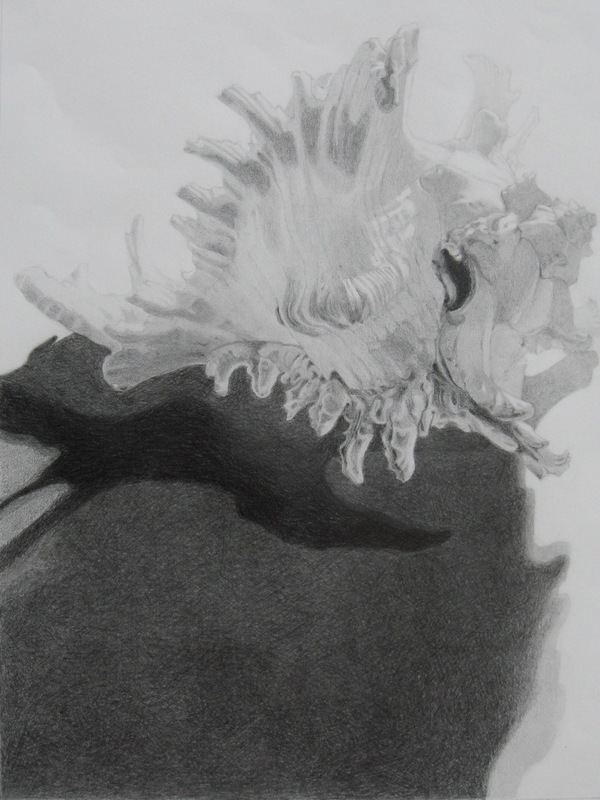 We drew into the canvas with graphite pencil and filled in areas with graphite. In the meantime while Amy and Grace were working on this piece, I took the opportunity to color a 22” x 30” sheet of Fabriano paper with graphite shading it from deep to medium and spraying it with fixative. I cut it up in to shapes and saved the little bits that fell to the wayside. Little did I know at the time that the others would find a use for those tiny bits. We came to a stopping point. I went home and Amy spent the night at Grace’s. Overnight I thought about those little bits and knew where there should be placed. I was going to share my idea with the others when I arrived at the studio the following morning. Upon my arrival, Amy and Grace were waiting for me. They had already placed those bits of paper where I had envisioned them to be. They wanted to share the positioning of the little pieces before gluing them down. I exclaimed, “you read my mind!” Weird surprise. 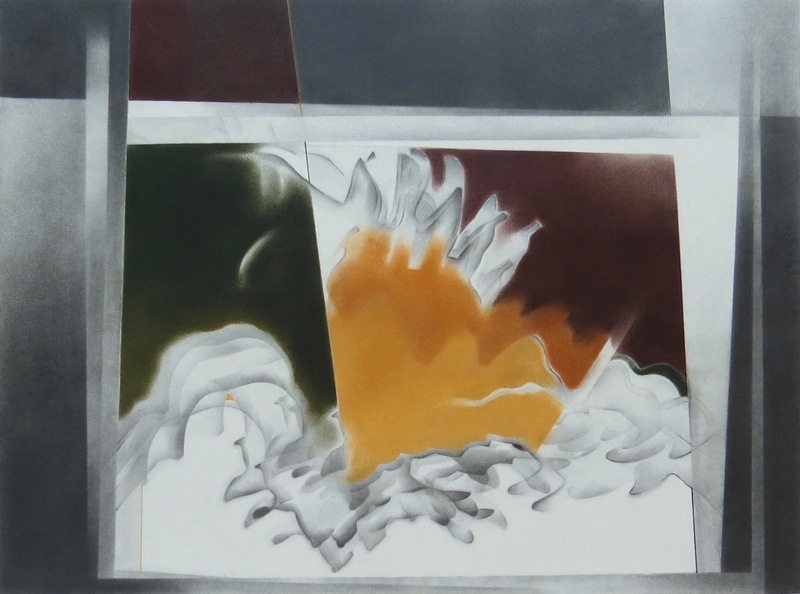 Note the small linear shapes at the top of the painting. 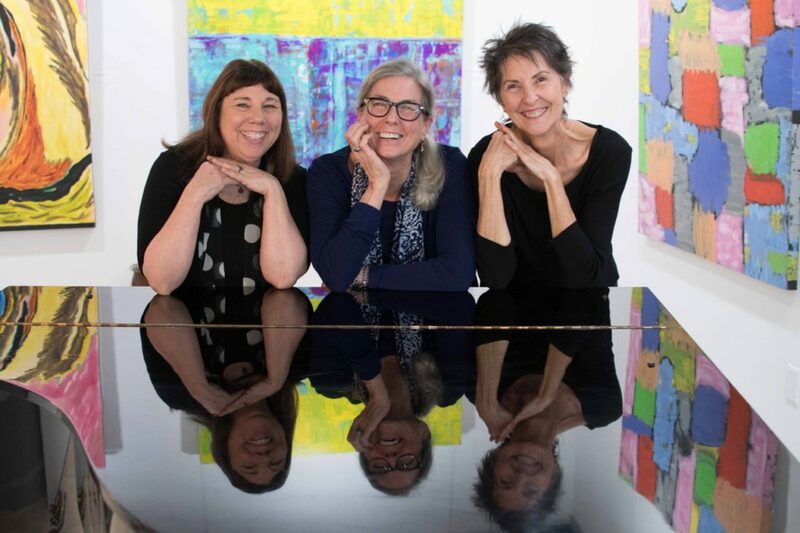 From left to right: Grace Howl, Kate Hendrickson and Amy Ernst taking a break for an impromptu photo in front of the painting, “Prescience of Three Minds No. 1“. A prepared transfer paper is waiting on the table in the foreground. While we were working on the practice canvas, we discussed a method of transferring images that both Amy and Grace have utilized in their own work. So, I took another piece of Fabriano paper and smudged into different areas graphite as well as graphites infused with green and blue pigments. 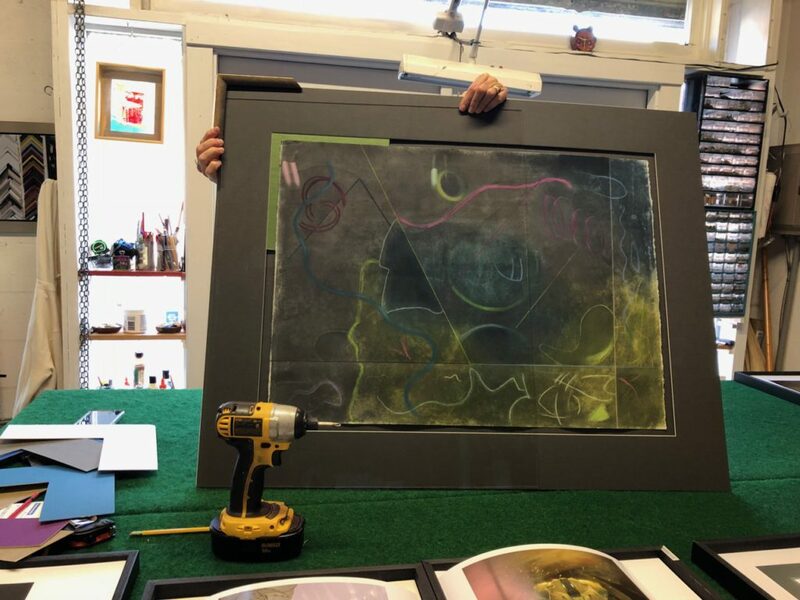 Once I got the surface permeated, we decided that we would use this as a platform to transfer marks to the large work instead of the smaller one which was close to completion. We set the small canvas aside and proceeded to lay the large canvas flat on the table. To transfer the graphite from the paper to the canvas, we first sprayed the canvas with water. Then, we laid the color infused side of the paper onto canvas taking various implements such as, wooden spoons, chopsticks, brush ends, etc. and drawing with them on the backside of the paper. The end result produced interesting almost caveman like marks on the canvas surface. 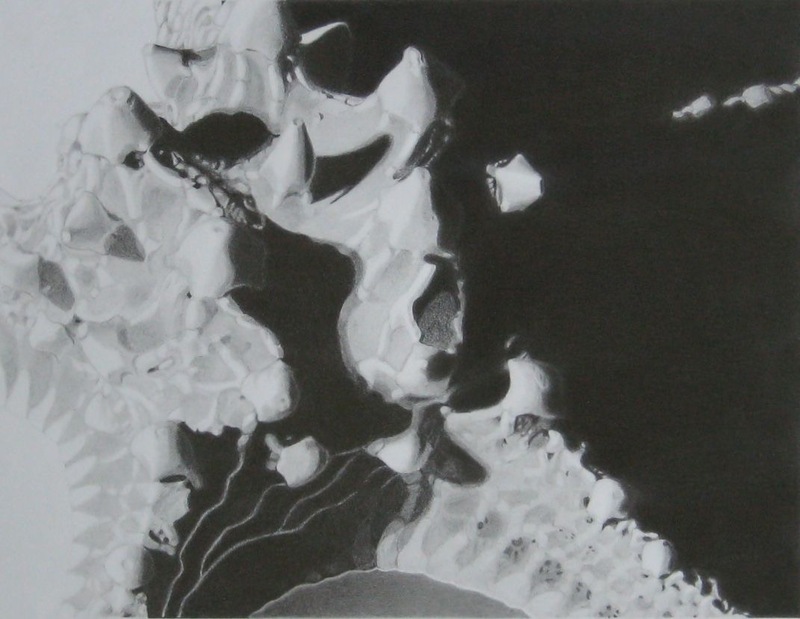 As we moved the paper around so that it touched all areas of the canvas, the additional application of water to the canvas caused the transferring graphite to spread out resembling mini river deltas. The paper itself was left with incised marks from the drawing tools as well as two fold creases from rubbing over the painting’s edges. Totally saturated with water, the paper was a wrinkled mess. I figured if it dried reasonably flat that I could cut it up for my collage work. We set the paper aside to dry. This was a good stopping point because the large canvas also had to dry before we could take the next step. Plus with a final review of the small painting where we made some corrections in color and markings, we considered it finished. Lo and behold upon our return for the next session, the waterlogged paper had dried flat. We three looked at it in astonishment. There were all kinds of ghost marks on the surface that called us to work into the piece. We chose to embellish these marks with pastel and colored pencil. Working on the drawing had the same easy rhythm of the small painting. The only difference was that we worked one by one taking turns while the others watched. By nature of the paper’s surface marks, we had to be a bit more deliberate in the decision of which ones to enhance. 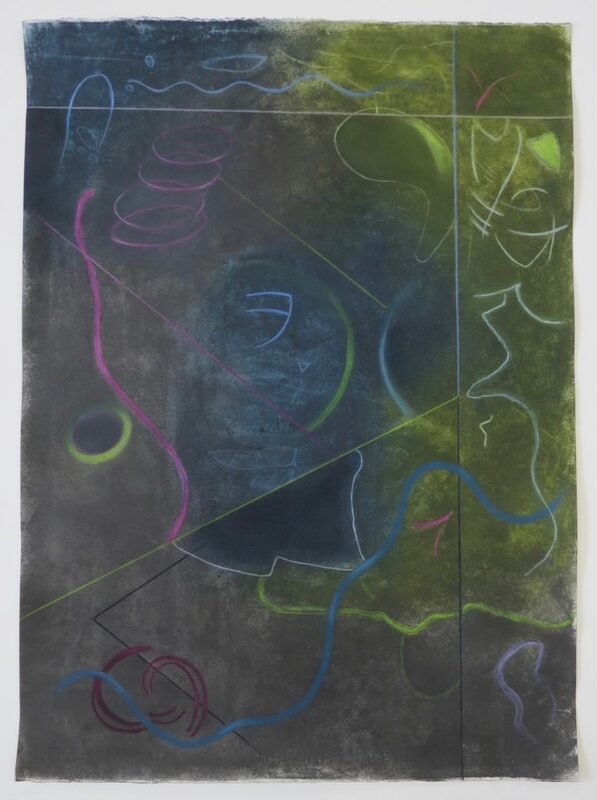 There was still just enough remaining graphite that we could rub out the pastel we did not like as well as soften some of the pastel lines that were made. The colored pencil added a subtle crispness to counter the soft surface lines. The final touches included darkening areas to push the space. Decisions about the specific color choices by each of us was intuitive. In essence, we picked colors we liked. This could have been a disaster if the hue choices had not meshed. 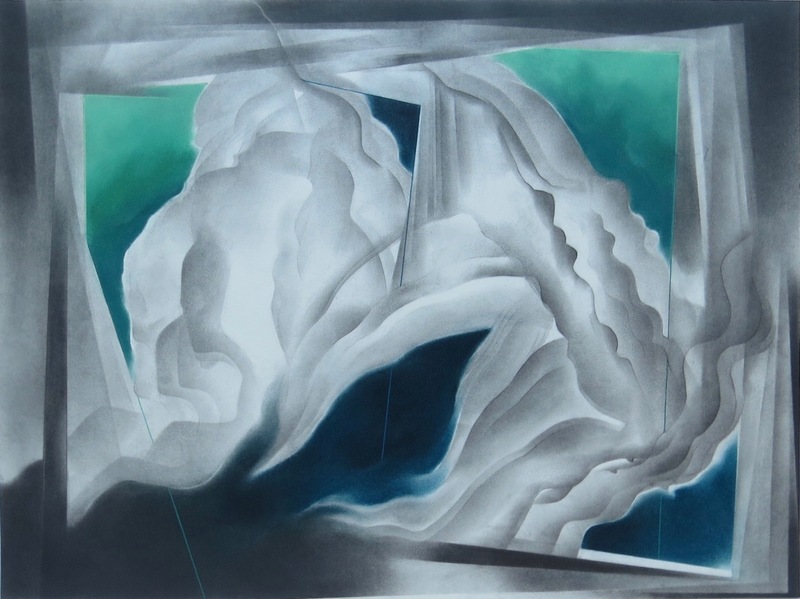 The result was a mysterious soft ground with luminescent lines and shapes moving in and out of the surface. This was when we realized how in sync that we were. Another odd surprise. 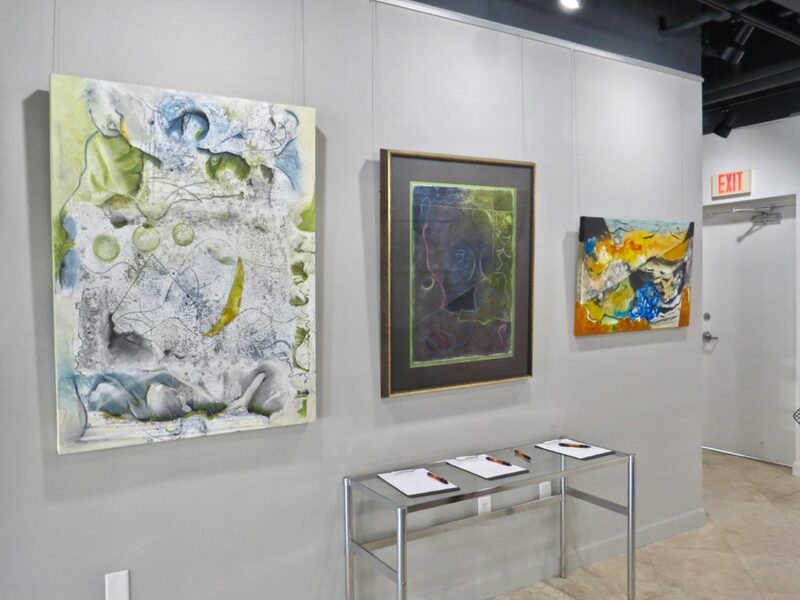 At this point we had clearly departed from the original intension of one painting, we now had the potential of three artworks that could be auctioned to benefit Pines of Sarasota. 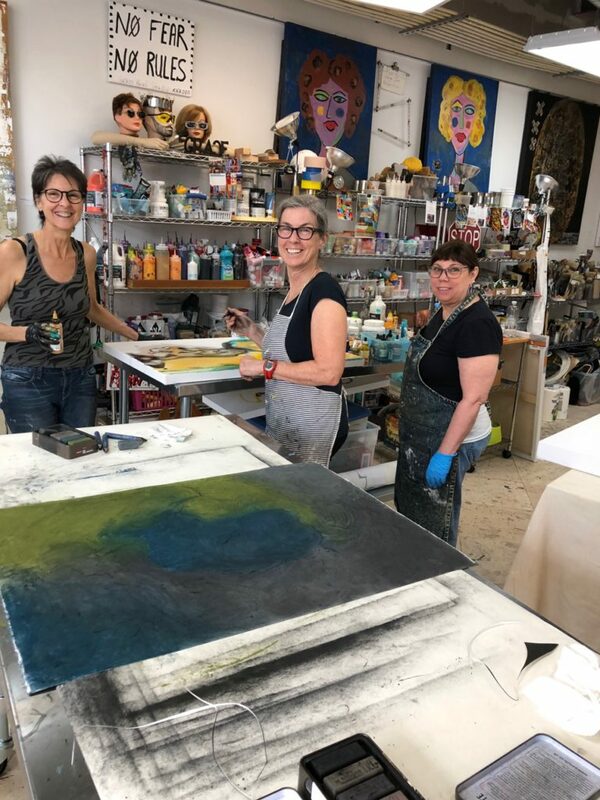 From left to right: Grace Howl, Amy Ernst and Kate Hendrickson working together on “Prescience of Three Minds No. 2“. 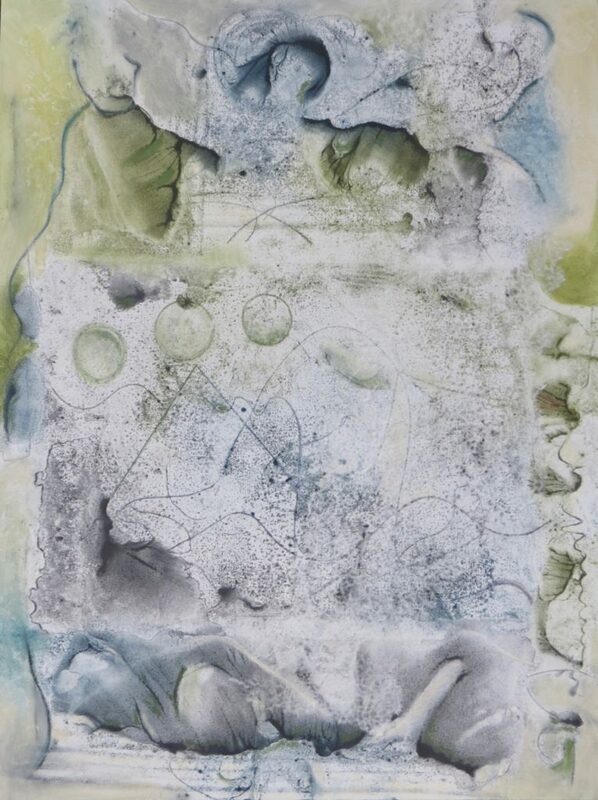 Concurrently, we created the composition on the large canvas making decisions based on the centrally located caveman-like markings surrounded by the mini-river delta or mountain-like forms. 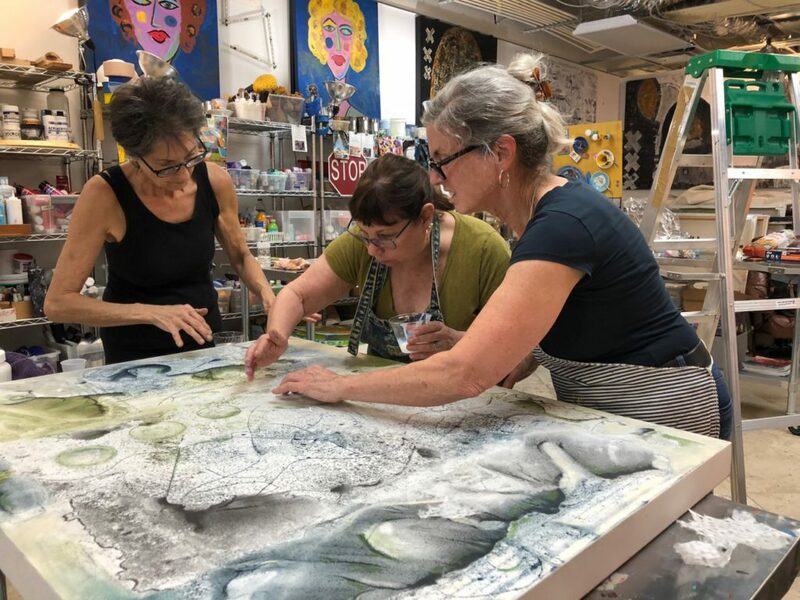 We rotated around the canvas always discussing our moves and helping one another if needed, especially when adding the rice paper collage elements. Acrylic paint, graphite pencil, colored pencil, pastel, white rice paper as well as colored rice paper were used throughout the composition. The end result was a work of art that could not be attributed to any one of us in particular. It is light, airy and somewhat dreamlike. There is a sense of landscape from a distance at the top and bottom with the caveman-like drawings bringing the center forward. Who created this painting? We joked, “A fourth artist came forward in the three of us”. Grace tackled the finishing touches on both the small and large paintings by masterfully wrapping the compositions over the canvas’s edges so framing would be unnecessary and then she varnished them. Selecting the new backing mat for “Scrivening” at Blue Door Framing. We took the drawing to Jessica Dirkes of Blue Door Framing. Being cost conscience even though Jessica was donating the framing to our fundraising effort, we picked Plexiglas. We also chose a dark mat and dark background to float the work upon. It looked great at the framing studio. However, once we got it back to the gallery and hung it, it was another story. 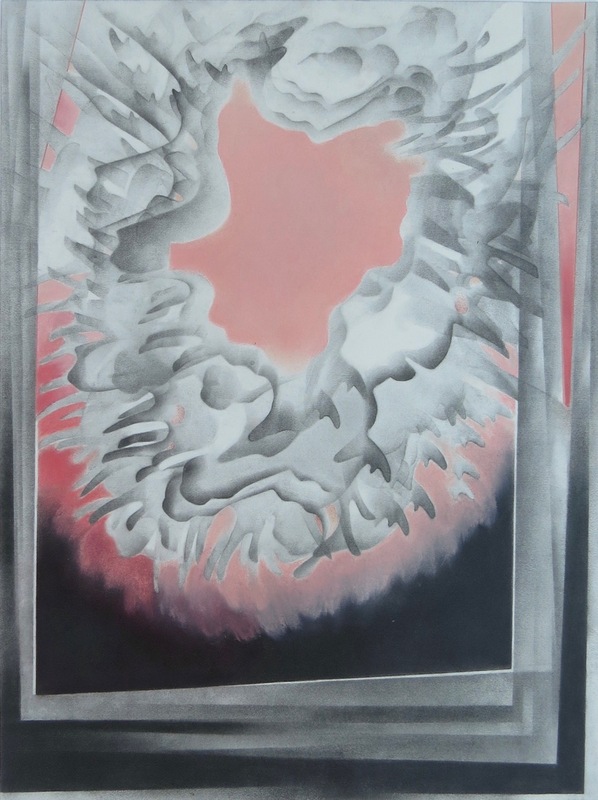 The Plexiglas was so reflective that the subtle work in the drawing was impossible to see. Plus the dark backing although complementary was not highlighting the beautiful edges of the paper. We learned that dark, mysterious works need to be framed with reflection in mind as well as the edges of the paper. So we took the drawing back to the frame shop and changed out the Plexi for non-reflective glass. What a difference! You could see the fine details. 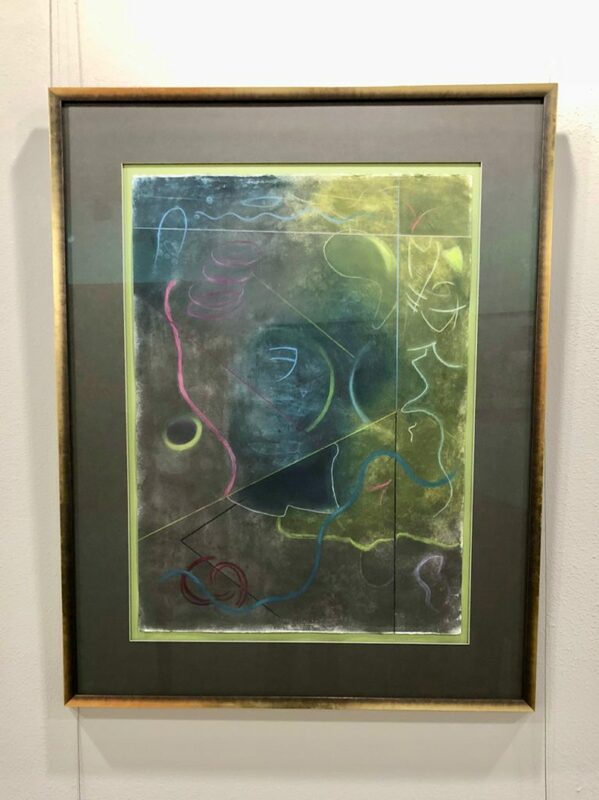 Switching out the dark background for a color seemed like a bad idea when we first framed the piece but now the selection of a similar green as in the work captured it so the edges could be finally seen. I see the painting, “Prescience of Three Minds No. 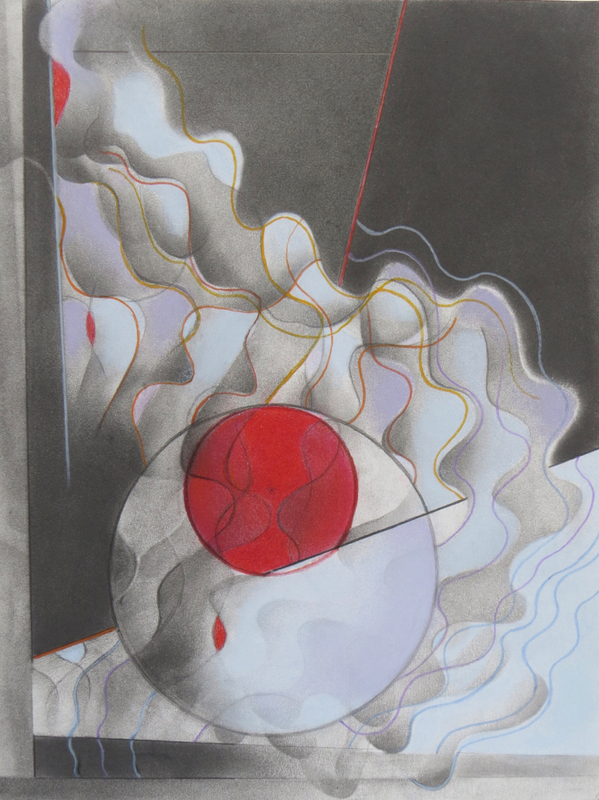 2” having mystical airiness and its companion drawing, “Scrivening” having luminescent mystery. And despite being apart in contrast, they are indeed related in sensibility. Indeed, the fourth artist created these pieces. “Prescience of Three Minds No.1” was the experimental work to see how our collaboration would flow. It holds on to our individual characters but nevertheless came together in harmonious concert. Earlier in the blog when I was discussing the date selection for the exhibition, we had not yet selected a title for the exhibition. We had a long list but nothing was ringing true. During a photo session for promotional images for the exhibition, the photographer asked us to lean on the grand piano located in Grace’s gallery space. When we saw the shots, we knew right then and there what the name would be. The image of the three of us leaning into one another with our reflections on the piano top said it all. REFLECTIONS OF COLLABORATION : New York-Chicago-Sarasota. From left to right: Amy Ernst, Kate Hendrickson and Grace Howl in the photograph that said it all. From a personal perspective the collaboration with Grace and Amy was quite different from my on going collaboration with Pamela Staker. Nevertheless both experiences have been artistically enriching. 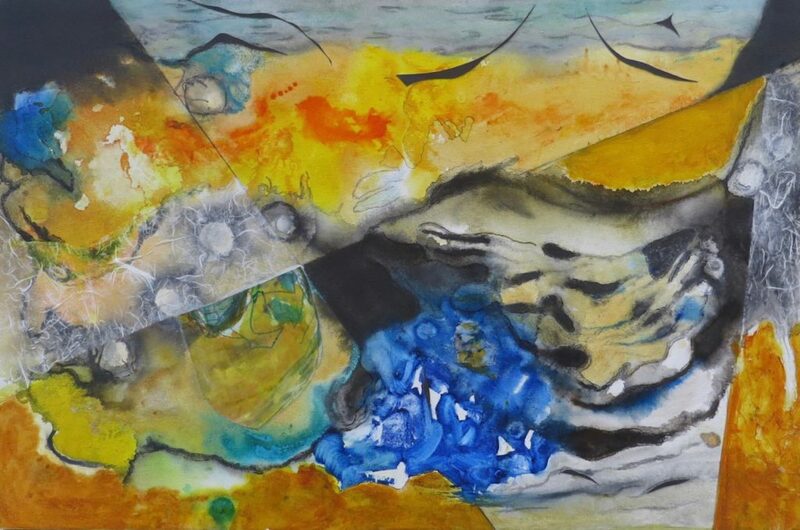 Pamela and I have worked on each other pieces separately trading them back and forth. There has been the challenge in deciding what to do next after the other has altered the composition. In the case of the collaboration with Grace and Amy, we all worked together on the pieces simultaneously. Being together in constant conversation about the next mark, the placement of collage, what color, which medium, etc. was harmonious. We all intuitively knew what the next step would be before taking it. There was an ease in which the compositions came together allowing us to complete three works in a fairly short period of time. In the end, there was not one argument about anything during the entire experience which added to the surprises that happened along the way. Who knew? 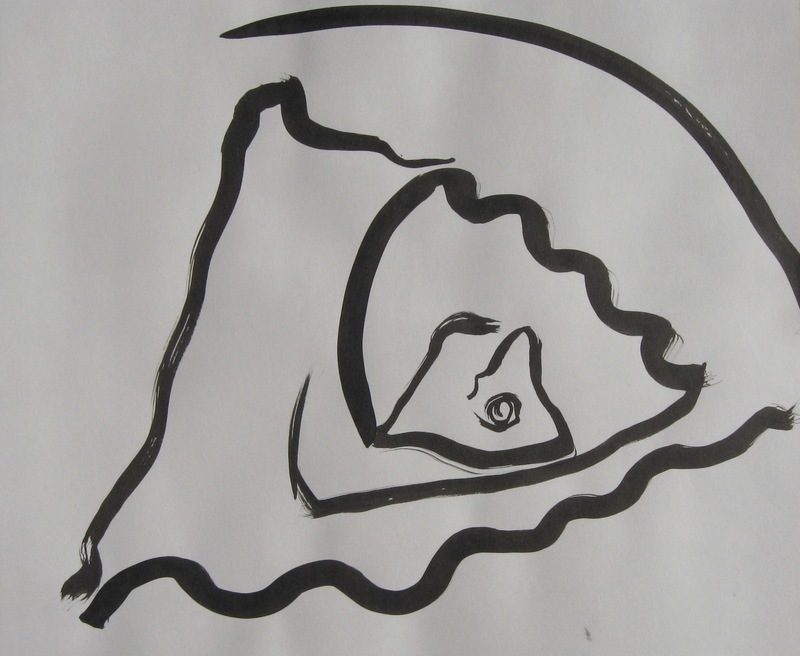 This entry was posted in Collaborations, Exhibitions.